DF in Argentina: ¡Fracásos lingüísticos! The Spanish is, as they say, on the upswing. Oh, wait, they don't say that. We do. Or at least, I do. But as I slog through my intensive Spanish course (four hrs of daily conversazione with a real-live Porteno who is obliged to listen to me and comment on my usage and grammar), it becomes clear how many gradations (or, I've just learned, "matices") of language knowledge there are. Which is to say: When I went to my language school's activity last night, a yoga class en Espanol, the other students, all beginners, all marveled (unwarrantedly, obv.) at the fluency of my comprehension. But the yoga teacher, who's one of my instructors, agreed wholeheartedly when I explained to the beginners (a group of Aussies taking a world tour that's limited for unclear reasons to the Southern Hemisphere) that my Spanish is far, far from perfect. This is not false modesty, or even its obnoxious cousin, false false modesty, but rather a simple and incontrovertible fact. I have crossed a threshold where I can, more or less, converse with most (though not all) Portenos. This is something that I've long wanted--functional fluency in Spanish--yet despite, or perhaps even because of this increased language ability, it's become clear to me that one can be more or less conversational in a non-native language and still make errors all the time. And I mean all the time. Weirdly, these errors are often very basic ones. I'll rock the pluscuamperfecto but then forget that "ley" is a feminine noun. I'll deploy the subjunctive but forget that my interlocutor is singular, not plural. And so forth. My theory on this is that those parts of foreign languages that do not exist in one's mother tongue (for English this would include, e.g., gendered nouns, the subjunctive mood, and declining nouns) are very hard to instinctively understand and require the kind of constant concentration to get right that makes it hard to have an at-ease chat with someone. To illustrate, I thought I'd start a list of my most truly humiliating linguistic errors, or "fracasos" as I've become fond of saying, and with which word I'll be puncutating each of the following linguistic errors, largely for my own amusement, como siempre. --In seeking to say something about religion, or perhaps America, I used the phrase "pecado original." Or at least I sought to. What I really said was, "pescado original," or "original fish." ¡Fracaso! --For reasons unknown, I was trying to refer to "serial killers" and used a phrase that sounded like "matadores de cereal," which actually means "killer of breakfast cereal," such as your Kix and your Froot Loops and whatnot. 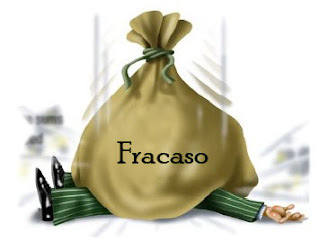 ¡Fracaso! --An attempt to comment on social class in America led me to desire to distinguish high-class and lower-class WASPs, though what I in actuality said was "high quality" and "low quality" WASPS, when when you think about it is also a relevant metric to distinguish them, though orthogonal to class, obvs. Anyway, ¡fracaso! More ¡fracasos! to come, no doubt. --Update: I was informed by a Porteno amiga that "fracaso" is far too strong a word to describe these kinds of linguistic errors, and that "error" (which is the same word in Spanish) would be more tonally appropriate. Hence the title of this post is itself an illustrative example of what this post is about. ¡Self-referential fracaso!